Brussels Sprouts (Brassica oleracea gemmifera) are members of the cabbage family. Their color ranges from light green to red or purple. The red-purple sprouts tend to be sweeter and go well with chestnuts. For a few days around Christmas 2010, UK Burger King restaurants offered a 'Sprout Suprise Whopper'. It was a classic Burger King Whopper with Brussels sprouts and Emmental cheese. 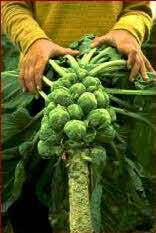 Brussels Sprouts were first grown in quantity around Brussels, Belgium, hence the name. They may have been been grown there as early as the 12th century, other sources say the first recorded description of Brussels sprouts dates to 1587 by Dutch botanist Rembertus Dodonaeus. Many sources say they were known in ancient Rome. Some of the confusion comes from interpreting descriptions of older forms and varieties of plants, written in older forms of other languages by people who may be writing about plants described to them by others who may have never actually seen the plants themselves! Numerous sources state that the king of Belgium recognized Brussels sprouts as the country's official green in 1820, or that they were discovered by the kings gardener in 1820. The problem with this story is that Belgium had no king in 1820 - and did not even exist as a country. The area that became Belgium was part of the United Kingdom of the Netherlands until a revolution in 1830 when the area gained its independence and adopted Belgium as the title of the new kingdom. Leopold I became the first king of Belgium (King of the Belgians) in 1830. The first printed reference in English to Brussels sprouts is from 1796 in 'Plain and Easy Introduction to Gardening' by Charles Marshall. Brussels sprouts are very popular in Great Britain - they grow about six times as many of them as the U.S.